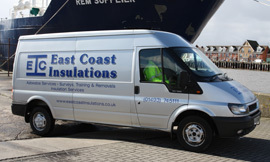 East Coast Insulations was established in 1983, and are a family run business, with our combined management team having over 100 years experience in the asbestos and insulation industry. •Fabrication and fitting including bespoke metal cladding. We are the oldest asbestos licensed company in East Anglia with no prohibitions notices or prosecutions set against us. Directors, Jason and Colin Boast, have a very complex commercial and engineering background which is put to great use when working alongside clients to ensure that the works are carried out with as least disruption to the day to day running of their business. Combined with the extensive experience of their 3 contracts managers, Keith Mortlock, Adam Lubach and Keith Yellop, who between them have over in excess of 88 years experience in the insulation and asbestos industry, we are a team that pride ourselves in giving a friendly and conscientious service providing us with a high level of repeat business. As a family run business we believe that it is of greatest importance to employ and invest in young people, we have 2 young men who last year undertook their Insulation Engineering apprentices in Thermal Insulation Diploma Level 2 City & Guilds under the guidance of our extensively experienced Insulation Supervisor Russell Goldsmith, these young men are already working to the highest standards and becoming a credit to themselves and East Coast Insulations. All East Coast Insulation staff have CSCS cards and full DBS checks. East Coast Insulations have worked on projects ranging from small removal contracts for residential property owners to large-scale removals in commercial buildings. 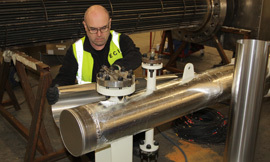 Our clients include international food producers, local councils, hospitals, schools, residential homes, universities, offshore industry, engineering companies and domestic premises.